I ran my first Tough Mudder on November 12th, 2016: the legendary World’s Toughest Mudder in Las Vegas. 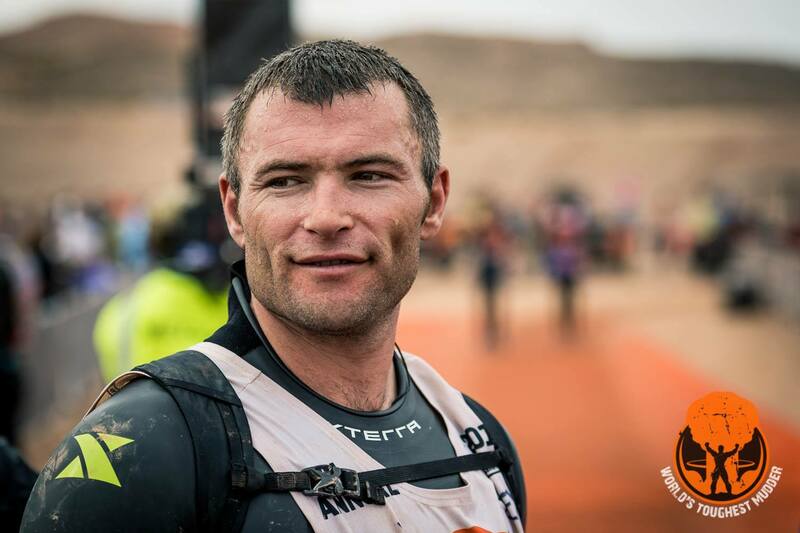 It was a fantastic experience and a journey into the endurance world that I had not yet experienced. The goal of that first Tough Mudder event for me was to experience something new, or in other words answer with confidence that beckoning question: When was the last time you did something for the first time? A year later, just a few months before World’s Toughest Mudder 2017, the question came up again. I was contacted by Kyle Railton (fondly known by most as Coach T. Mud) from TMHQ and Sue HB over at Merrell with a compelling project. They were in the early planning stages of a project that had been dubbed Project Superman 25. Unlike all my other endurance endeavors up to that point, for which I set personal goals to achieve, Project Superman 25 would be the first endurance event I actively participated in where the goal was not for myself, but for a fellow Mudder named David Tyson Perry. I told Coach and Sue I was definitely in. I’ve worked with many endurance athletes to take on long adventures. I’ve helped with their training, preparation (both mentally and physically) and assisted with in-race strategies like proper pacing, nutrition, and body management. But working with Tyson (also known as Superman) was going to be a little different. Tyson is a dedicated Tough Mudder athlete. He has completed 9 Tough Mudders and had plans to make WTM2017 his tenth. He’s no foreigner to the Tough Mudder obstacle structure, but this would be his first 24-hour event. Tyson is also paralyzed from the waist down, the result of a traumatic spinal cord injury that happened when Tyson was 19. On a phone call with Coach, he explained that this year, we would take on World’s Toughest Mudder as a team and work to accomplish Tyson’s goal: to be the first paraplegic athlete in a wheelchair to attempt the World’s Toughest Mudder and, on top of that, to earn the coveted 25-mile patch. Over the course of a few months, Coach, Tyson and I worked together to devise a plan to achieve Tyson’s 25-mile goal. We talked about pacing, safety modifications to obstacles and structure of the team roles. 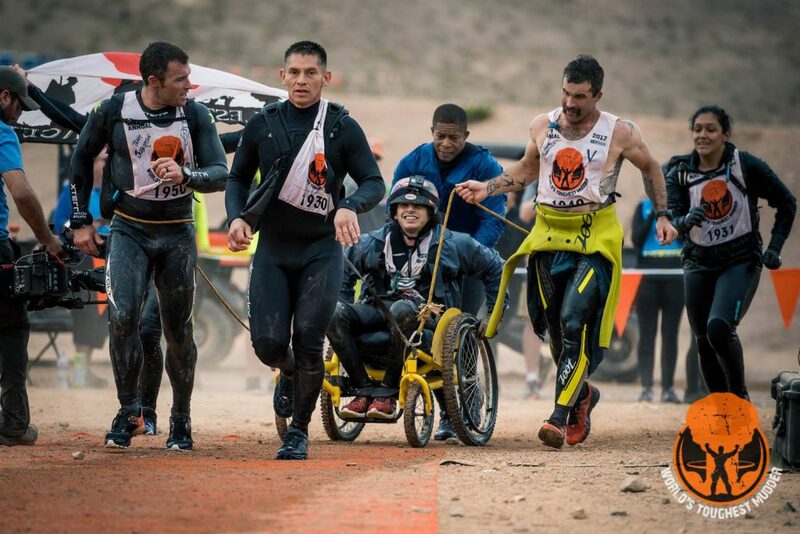 I even consulted with the Director of Operations at Tough Mudder Headquarters (TMHQ) to discuss and advise on safety for some obstacles and how to modify the infamous Cliff feature so that a paraplegic athlete could safely take that memorable plunge in Lake Las Vegas. A week before the race, I got a call from Coach notifying me that Tyson’s wheelchair broke during training at the Las Vegas Tough Mudder. Coach scrambled to find a replacement and ended up finding a custom “All-Terrain” wheelchair company called Lasher Sport conveniently located in Las Vegas, NV. We were excited to find this incredible custom company but without any financial support, there was no way Team Superman would be in one of these things come the big day. Between the generosity of Lasher Sport and a little #MerrellMagic, a wheelchair was hand delivered less than 24 hours before the race by the owner of Lasher Sport. On race day, Coach and I drove to our pit area to greet Tyson and the rest of Team Superman (aka Team Go Hard) when they arrived. Once everyone had gathered around, we got reveal to Tyson that, through the efforts of Coach, Lasher Sports and Merrell, we were able to get him one rocking chair! It was a great way to kick off the morning, and we spent the rest of our prep time scrambling to set up ropes and attachment points to the new wheelchair. Since Tyson was the team leader, it was his job was to let us know how and when he wanted assistance. That seems straight forward, but when that gun goes off the chaos is hard to avoid. Tyson’s long time friend, Freddie, was equipped with a chest harness designed to drag massive tires and was appointed “lead horse”. Coach and I positioned ourselves on either side of Freddie to provide horsepower. Lavar was at the rear stabilizing with Will and Bianca. Tyson was captaining his new wheelchair, providing cues for the rest of the team on when to tow and when to back off. One of the main struggles for an adaptive athlete is determining what level of “adaptation” or modification you want to integrate into your experience. For Tyson, it was balancing the amount of self-pushing he wanted to do versus the support and physical output from the team. It’s a battle and balance of ego and expectations and at the end of the day, that equilibrium is achieved through constant communication throughout the race. For the paraplegic adaptive athletes, penalties are not penalties (usually), they are simply the course. In other words, for the sake of safety, any obstacle with electricity or an unbelayed, uncontrolled drop is automatically out of the question for us and we are forced to take the penalty for that obstacle. We tackled the obstacles we could and racked up bonus miles for the ones we couldn’t. We used an immense amount of teamwork to get over, under around and through these obstacles (many of which I rigged a safety line to so we could ensure that if Tyson did fall, he would not be injured). Adrenaline and team enthusiasm skyrocketed during lap 3 when we arrived at the our biggest challenge yet. The Cliff was open. A 35-40’ freefall into a body of water is an exhilarating experience for any WTM competitor. For Tyson, an uncontrolled fall into that body of water presented a high probability of serious injury. I worked with TMHQ to devise a system that would allow the adaptive athletes to have a “controlled” plunge over the cliff and it was executed perfectly. We had one member of the team jump first, then we lowered the chair into the water and got it to the other side. Then two teammates assisted Tyson (connected to the safety line) to the edge of the cliff. Teammate #4 teammate jumped while our 5th teammate helped Tyson drop over the edge. After Tyson reached the water, he was able to swim across. It was refreshing and inspiring to see the crowd cheer Tyson on as he overcame that obstacle. It was a great moment in the race for us as a team. We started communicating more, and it was reflected in our efficiency. By lap 4, we could feel the sum of the miles in our legs. The witching hour had arrived. We worked our way around the course, but at each obstacle I got more nervous about our time. As we approached the final hill to the cliff we discussed importance of efficiency and a fast turn around in the pit. The team agreed that we would not take the usual 1-1.5 hours, we would keep it to a strict 20 minutes. As soon as we hit the pit I called out an 18-minute countdown to lap 5. I doubted the team’s ability to transition so quickly, but as I watched everyone quickly eat and gather supplies, it was clear each and every member of Team Superman was committed to making it around the course one more time before the cut-off. Lap 5 was incredible. We took the lessons learned from the course and from each other over the last 20+ hours and put them into our strategy for the final lap. As we moved through each obstacle, we became more efficient and faster than before. It had only taken us twenty something miles and twenty something hours, but team Superman had evolved into a brotherhood (and sisterhood thanks to Bianca) and we were operating like a well-oiled machine. As we hit our final miles, I knew we would make Tyson’s 25-mile goal. The mood had lightened. I was glad to have shared the last 24 hours with my friend, Coach. I was thankful that Merrell had included me in this project. I was really excited for Tyson, but also for Freddie, Bianca and Lavar. Those three had worked hard and had broken through their own 24-hour endurance threshold. I won’t soon forget the determined look on their faces as they charged up the final hills towards the finish. We reached the cliff for one last plunge and ran through the finish line with 25 official miles under our belts before the cut-off time. I’ve now completed the World’s Toughest Mudder under two drastically different circumstances, one solo (75 miles) and one on behalf of Team Superman. As part of Team Superman, I ran a synchronized marathon with weighted resistance the entire time. It’s a real challenge, but not as difficult as tackling the mental hurdle of making sure all 6 members of the team are working together. 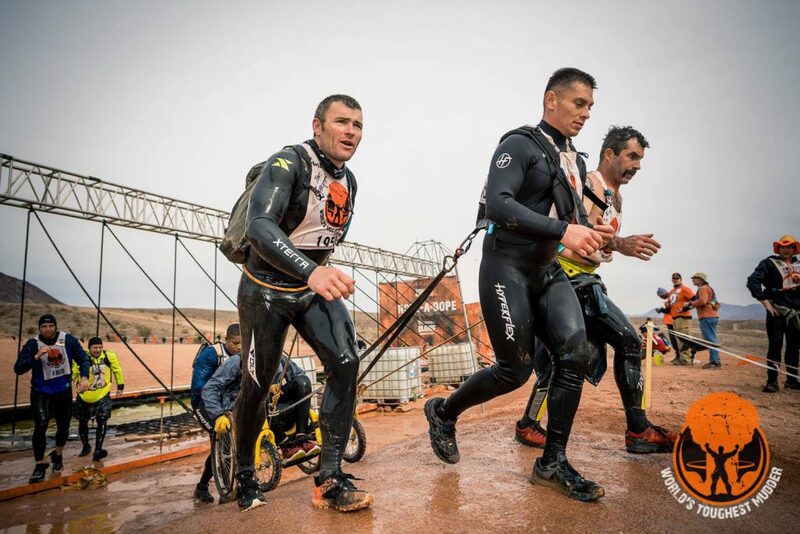 Tough Mudder events are one of the best ways for adaptive athletes to challenge themselves mentally and physically. The course (by natural design) can be adapted without deviating from the sport-experience of any other competitor out there. Those modifications can come in the form of penalty miles or simply changing the difficulty of an obstacle by standing on the shoulders of fellow Mudders. The point is that the modifications really don’t seem like much of a, well, modification. 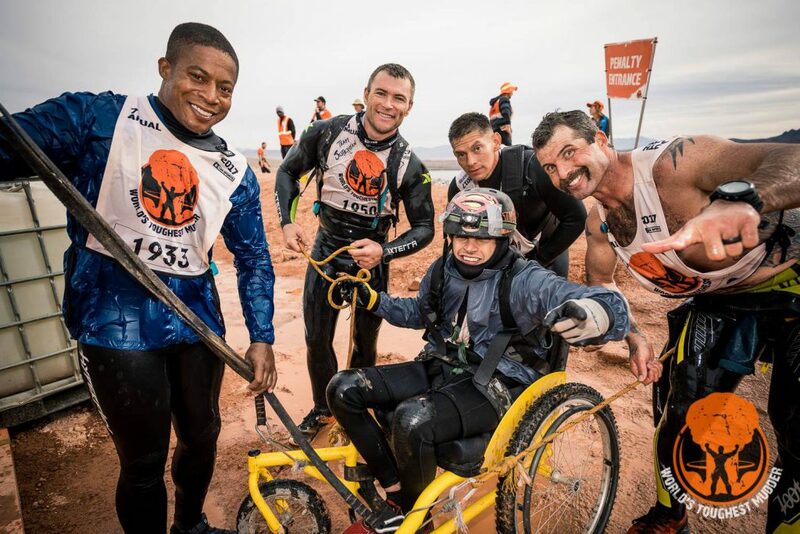 The inclusive Tough Mudder culture that challenges athletes to adapt and overcome works for athletes of all abilities. I look forward to seeing what other barriers will be broken on the WTM course in years to come.